Races are commonly held in metropolitan areas, which means long trips to rural locations aren’t necessary. Cyclocross racing doesn’t have to consume your entire weekend, perfect for those with other commitments. You can spend two hours at Home Depot, clean your kitchen, hang out with your dog, AND still race! Race expo areas provide food and drinks to keep you sated after your race. 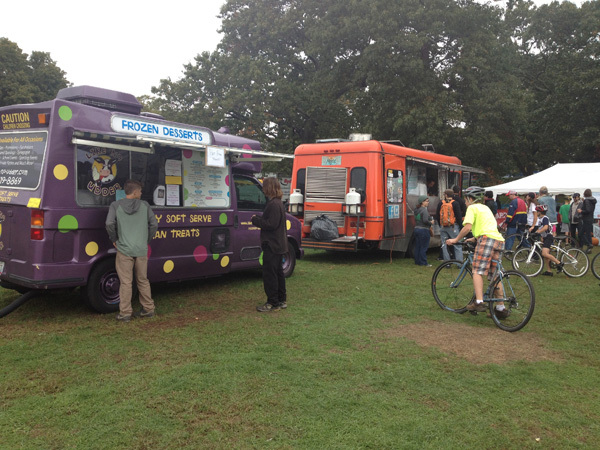 At cyclocross events near cities, it’s common to see gourmet food trucks parked at the event, like these trucks above at the Providence Cyclocross Festival. 6. Spectators are just as important as the racers. 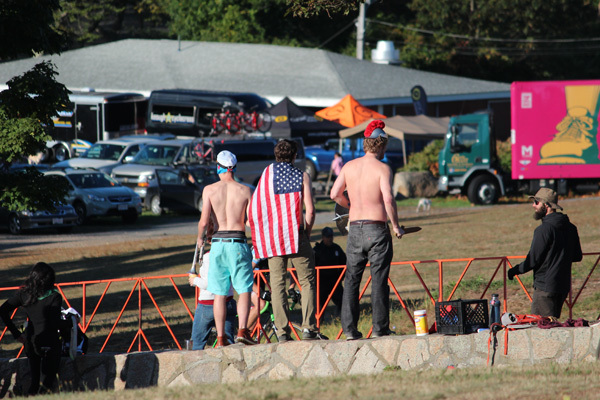 Unlike road racing, it doesn’t matter where you are within a cyclocross race?you’re still a part of the race. Whether you are contesting the win or riding at the back, you’re never too far from the action and cheering. As a testament to cyclocross’ inclusive, fun, and friendly nature, participation is growing faster than any other discipline of bicycling. From 2007-2008, cyclocross grew 23% in Colorado, while overall racing numbers increased just 3%. In New England, amateur women’s fields are filling to capacity, with 100 entry-level riders toeing the line at key races. Cyclocross races are also good for the economy, especially high-level races that attract riders from across the country (and world!) The Harbin Park Cyclocross Race in Cincinnati, Ohio was estimated to bring $200,000 to the community in 2010. Seventy percent of participants traveled in from over 100 miles to compete, and more than 80% stayed two nights or more in the region. Another study found that the 2009 USA Cycling National Cyclocross Championships brought more than $1 million in direct spending to the Bend, Oregon region. There are established cyclocross series in New England, the Mid-Atlantic, Pacific Northwest, San Francisco Bay Area, and Colorado’s Front Range. Nowadays, many other cities have growing scenes too. From Florida to Alaska, cyclocross races are popping up all over the country. Find a cyclocross race near you at usacycling.org and see for yourself why it’s the hottest new kind of bike racing. > Give us your best cyclocross heckle!